Track your time spent on the job and create professional invoices with Billing Hours. 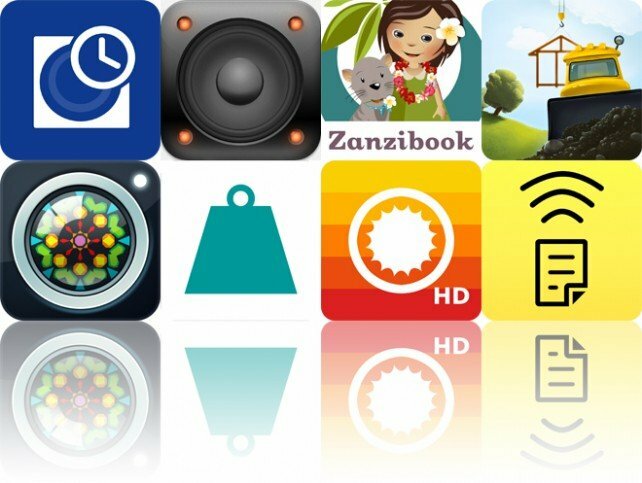 We also have an app that allows you to get the beats flowing no matter where you are, and an interactive storybook that takes your child on an adventure through Polynesia. Air Scanner: Wireless Remote HD Document Camera and Overhead Projector Replacement ($4.99 Free, 1.1 MB): Project whatever your camera sees onto your computers screen with Air Scanner. Getting Air Scanner up and running is remarkably easy. Just launch the app on your iDevice, point your browser at the provided URL, and then point your iDevices camera at whatever you want to project. Air Scanner will continuously take photos and send them to your browser in 720P or 1080P, depending on the type of iDevice. Air Scanner: Wireless Remote HD Document Camera and Overhead Projector Replacement is available for free today only (03/30). It has a 5-star rating with a total of 5 ratings. KaleidaCam ($1.99 Free, 2.4 MB): Create awesome kaleidoscopic works of art with this photography app. Just point your iDevices camera at a subject to see it in a totally new way. Snap a photo if its something you want to capture forever. The app includes four customizable kaleidoscope styles, full resolution images, and a variety of sharing options. KaleidaCam is available for free for a limited time. It has a 4.5-star rating with a total of 124 ratings. Billing Hours ($1.99 Free, 2.3 MB): This business app will take the work out of time tracking and billing. When adding a new client, youre able to attach as many details as you like including your rate per hour, pay period, and location. Then when the job begins, just choose the appropriate client and clock in as needed. Youre also able to keep track of any items needed for the job. Entries can be filtered by date range, state, and type. Youre able to generate professional quality invoices from all of your entries and quickly email or print them out via AirPrint. The app also includes support for unlimited clients, projects, invoices and reports, and the ability to passcode protect your data. Billing Hours is available for free today only (03/30). It has a 4.5-star rating with a total of 9 ratings. Strong – Workout Tracker ($4.99 Free, 7.7 MB): Today only: Record unlimited workouts for free with Unlock Strong. Thats a $4.99 value! To get Unlock Strong for free, just launch the app, tap on Settings, and then tap on the Store link in to top right corner. Strong doesn’t waste your time with ridiculous instructions and unnecessary photos. Instead, it allows you to craft the perfect workout routine and help you stick to it with little hassle. You’re able to create as many routines as necessary and populate them with exercises from Strong’s built-in list or craft your own. Training data like reps and weight can then be entered in a snap. When you’re done with your workout you can attach notes if necessary, and record your bodyweight and view your total weight lifted. Strong will keep a history of your progress, allowing you to find out if what you’re doing is actually working. The app also includes a customizable rest timer, the ability to export workout information, and imperial and metric support. Strong – Workout Tracker is available for free today only (03/30). It has a 4.5-star rating with a total of 7 ratings. Build and Play – Construction Play Scene ($0.99 Free, 87.3 MB): An entertainment app that allows your child to build their own constructions scenes and play memory games. Your child is able to populate their scene by dragging more than 30 different stickers into place. The stickers feature sound effects and simple animations. The memory games consist of the same charming characters and machines, and can be played with four, six, or 16 cards. Build and Play – Construction Play Scene is available for free today only (03/30). It has a 3.5-star rating with a total of 35 ratings. Lulu in Polynesia ($0.99 Free, 142.0 MB): An interactive storybook app that allows your child to follow Lulu and her cat Zazou on their adventure through Polynesia. The app features audio narration to progress the story and help guide your child through the activities. It also includes 15 interactive and animated pages, six mini-games, humorous dialogue, original music, and an interactive map. Lulu in Polynesia is available for free today only (03/30). It has a 4.5-star rating with a total of 18 ratings. Dubstep SX Loops / Synth / Drums / Effects ($1.99 Free, 63.7 MB): Get the beats flowing wherever you go with Dubstep SX. Youre able to create your own beats by triggering loops and effects. The reverb, delay, distortion, and volume can be adjustable for each type of loop to highlight them. Youre also able to tap away on a synth drum pad or blast melodies with the built-in keyboard. The app includes eight slots for recording mixes, four mixable saw waves, and the ability to share your creations via email. Dubstep SX Loops / Synth / Drums / Effects is available for free today only (03/30). It has a 3.5-star rating with a total of 27 ratings. ClearWeather HD ($1.99 Free, 7.2 MB): Get a colorful look at the forecast with this weather app. It color codes your entire forecast, so you won’t have to go digging around to find out what to wear today. Swipe up and down to switch between all of your locations. Swipe right to left to reveal a more detailed forecast. It includes 24-hour and seven-day forecasts, support for Celsius and Fahrenheit, wind speed and direction, humidity, precipitation, pressure, sunrise and sunset, moon phases, and five layout options. ClearWeather HD is available for free today only (03/30). It has a 4.5-star rating with a total of 37 ratings. To submit an app, simply send a request to tyler@appadvice.com with the subject Apps Gone Free. Please include the name of the app, a link to it in the App Store, when and for how long you intend to offer the app for free, and anything else you would like to share. We will take it from there.